Former Fed chairman Paul Volcker said in a speech to the American Academy in Berlin today that the ‘abuse’ of derivatives that helped Greece shroud its mounting debts highlights the need for regulation. Bloomberg: “Surely the recent revelations about the use (and abuse) of complex derivatives in obscuring the extent of Greek financial obligations reinforces the need for greater transparency and less complexity,” Volcker said. Being mindful of the kind of trades — the increasingly popular swaps contracts — that prompted the collapse of Lehman Brothers and brought to the brink of financial ruin the American International Group (AIG), European and U.S. officials are examining the role that investment banks including Goldman Sachs (GS) may have played in masking the true extent of Greece’s deficit. A masking that was done with the help of a derivatives deal that legally bypassed the EU Maastricht deficit rules. “Credit-default swaps, where you insure your neighbor’s house just to destroy it and make money from it, that’s exactly what we have to curb,” German Chancellor Angela Merkel, said yesterday at a press conference in Berlin with Greek Prime Minister George Papandreou. 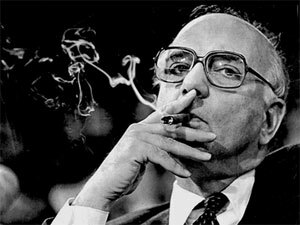 In his speech Volcker posed the question if we “can reasonably continue with a financial system that, implicitly or explicitly, relies on a firmly-held expectations that major financial institutions will be protected from failure in the face of financial crisis”. The former Fed chief suggested the U.S. government should assign responsibility to a new or existing agency “for system-wide surveillance, backed by clear legislative directives and authority”.